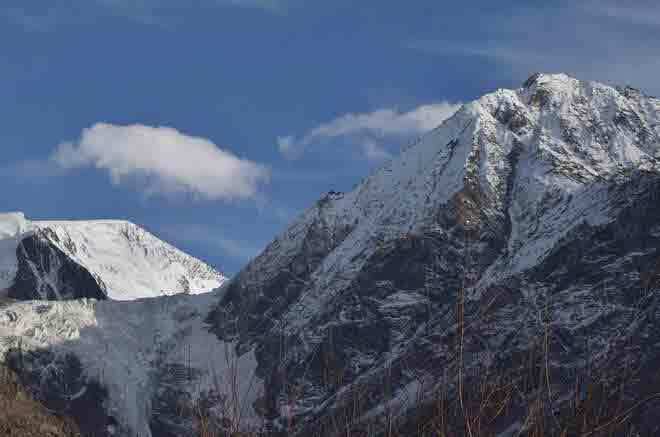 Normal life was hit hard in the tribal district of Lahaul & Spiti, which has been cut off from the rest of the world after fresh snowfall at 13,050-ft high Rohtang Pass, the gateway to the district. A majority of local roads within the district were blocked due to snowfall yesterday, which had hampered the transportation badly while light vehicles were plying on the main routes in the district. According to locals, biting cold wave conditions have sent the temperature plummeting below the freezing point. The residents have been forced to remain indoors because of the bone-chilling cold. Himachal Pradesh Road Transportation Corporation Authority has stopped its bus services on all routes across district because of public safety concern as snow has got deposited on the road. Gram Panchayat Pradhan Mooling Tanjin Angmo said that “fresh snowfall had hampered transportation facility in the region and we have been forced to remain indoors. For the last two days no light or heavy vehicles plied on the local routes because of snow on the road”. Susheel Kumar, a native of Kolang village, said that the fresh spell of snowfall had given some respite to the farmers in the region, who were waiting desperately for snowfall for a long time. “However, normal life was hit hard as there was no transportation facility in remote areas on local routes and now we have been cut off with the rest of world with road facility because of fresh snowfall at Rohtang Pass”, he added. Residents of the district have demanded chopper facility from the state government as journey had been become unsafe on the Manali-Leh highway via Rohtang Pass because of fresh snowfall. Deputy Commissioner of Lahaul & Spiti Vivek Bhatia said the district administration would request the state government to provide chopper facility for transportation in the district if the Border Roads Organization (BRO) fails to open Rohtang Pass for vehicular moment. “According to weather forecast, there was prediction of heavy snowfall in the coming days”, he added.